No swimming or wading allowed, unless in the designated beach area. Dogs are allowed on a leash in the surrounding lake areas. No ice-related activities are permitted on the lake. Due to the possibility of damage to the lake liner, no anchoring devices are allowed on or around the lake. The information on this page is an overview and not intended to be comprehensive. Please make sure to download the watercraft user guide for additional, important information about watercraft usage, permit requirements and rules, equipment requirements, city code, rule enforcement and more. * Note: Some Wednesdays during the summer months will be reserved for the Therapeutic Recreation Adaptive Waterski Program - operating from sunrise to 3:30 p.m.
All motorized and personal motorized watercraft can launch and load only from the boat ramp. No staging or cleaning on the boat ramp. The gate must be closed and locked after the vessel is launched and the vehicle is parked. No person shall use any watercraft on Prospect Lake in a careless or reckless manner or as to interfere with the reasonable use or enjoyment of the lake by any other person. No person under 16 years of age shall operate a motorboat or personal watercraft upon the lake. Exception: Youth 14 years or older who have completed a boating safety course approved by the Colorado Division of Parks and Outdoor Recreation and have a boating safety certificate issued by the boating safety course provider in his/her possession. Adult supervision is required. USCG-approved personal flotation devices are required to be worn by all operators and passengers of personal watercraft, hand/human propelled boats, sailboards and sailboats. USCG-approved personal flotation devices must be in motorboats for every adult attendant, and youth (ages 12 and under) must have personal flotation devices on their person. During motorized watercraft operation, all traffic shall move in a counter-clockwise direction. Swimming or diving from any watercraft is prohibited. Operation of ALL watercraft is prohibited during an electrical storm. No motorized watercraft shall be operated while the operator or any occupant is standing or sitting on the gunwale or bow or in any unsafe position. Watercraft operation is only allowed in the designated boating and water-skiing areas. Watercraft operators must be aware of shoreline and swimming areas at all times. 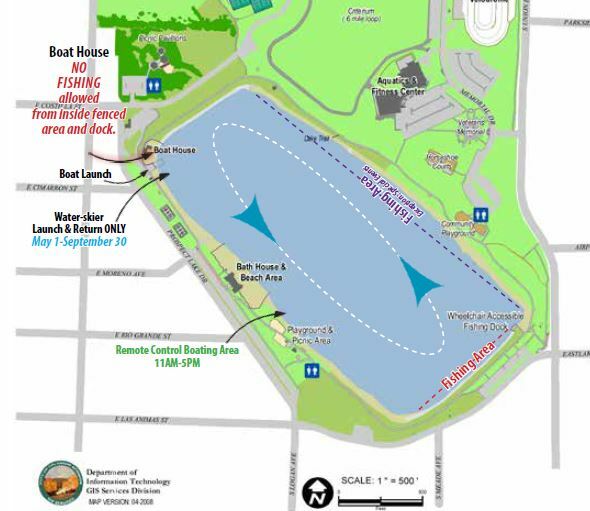 Remote controlled boats are only allowed in the southwest end of the lake during the hours of 11 AM-5 PM and should not go further than fifty (50) feet of shore. Water-skiing shall be permitted only during “motorized” operation times. Each water-skier shall wear a USCG-approved personal floatation device in serviceable condition. Water-skiing is prohibited within fifty feet (50’) of the shore. All watercraft towing water-skiers shall have aboard a responsible observer, in addition to the operator, who shall, when launching a water-skier, when a water-skier falls down in the water, when signaling to return to the shore or when the watercraft is retrieving its water-skier, conspicuously display a flag. The launching and discharging of water-skiers at the shore shall be limited to the designated area only. Water-ski towropes shall be no longer than one hundred feet (100’) in length. Watercraft towing water-skiers shall have the right of way over other watercraft. Kayaking and Paddleboard rentals are available through http://www.supcoloradosprings.com/. Gas powered motorized watercraft are prohibited on the lake. All boats/vessels must be operated in a wakeless manner. * Special events and organized open water swimming may be scheduled during boating times. These activities will pre-empt some or all boating hours for the duration of the event. No person shall use any watercraft on Quail Lake in a careless or reckless manner or as to interfere with the reasonable use or enjoyment of the lake by any another person. Adult supervision is required for all youth under the age of 18. USCG-approved personal flotation devices must be available on a non-motorized vessel for every adult attendant, and youth (ages 12 and under) must have personal flotation devices on their person. Paddleboard rentals are available through http://www.supcoloradosprings.com/. Key Deposit (for the boat ramp): a $10 key deposit will be assessed when purchasing a permit. The key deposit can be credited to the following year's account or a refund can be processed when the annual key is returned. Sertich: Monday-Friday from 8 a.m.-5 p.m.
Boathouse only during vendor's hours of operation. Only fishing is allowed on the southeast side of the lake. Fishing is never permitted from inside any fenced area around the lake. Fishing is allowed on the northeast side of the lake, except during designated special events. No ice-related fishing activities are allowed on the lake.